Martin Padgett March 1, 2016 Comment Now! There's a new phrase for the very top layer of luxury in the car world. "Pinnacle cars" are the diamond-quilted, champagne-fluted versions of, you know, everyday luxury cars. A Benz S-Class isn't good enough to qualify. Make it a Maybach. Better yet, make it a Pullman. A Phantom? Fine, for starters. You do have a custom paint color in mind, don't you? At Bentley, the pinnacle car is the Mulsanne. It's a sedan with the pedigree and performance to claim best-in-class status, if not best-in-world. With rivals like those, that's no easy claim to make. Bentley's pressing the claim, convincingly, with an updated Mulsanne range for 2017. New to the lineup are a long-wheelbase model, a very exclusive and even longer-wheelbase model, and new technology on the safety and infotainment fronts. The world got a first look at the newly revamped sedan at this week's 2016 Geneva Motor Show. Motor Authority went to Crewe last month for an in-depth look at the new Mulsanne, behind the scenes at the Crewe factory that hand-crafts and robot-welds the brand's peak four-door. Assembled under the same roof as Continentals and Flying Spurs and Bentayga SUVs, the Mulsanne has one of the more distinctive launching pads in the automotive world. In a world where churning out mass-market cars can take as few as 17 hours, the Mulsanne can take up to 400 hours. Still, it's a benchmark of efficiency. Much of its body is built with the most advanced technology available today. Aluminum and steel are glued and riveted and welded together without any human input. The Mulsanne also has more hand-crafted content than just about every other vehicle made by a major manufacturer. That's what takes up those extra 383 hours. In its spotlessly clean production lab, modern technology blends in with its Etsy analogue. Robots weld aluminum body sections together, while craftspeople braze metal panels together to create the Mulsanne's elegant roofline, or spend weeks composing the wood and leather trim that wraps the Mulsanne interior to the buyer's whim. "It needs to look like an orthopedic clinic in here every day," says Bentley chairman Wolfgang Duerheimer, as we dine off bone china at the end of the production facility, amid kanban bins full of future-Bentley bits and pieces. With the 2017 model year, the Mulsanne lineup gets a mid-life stretch. The standard car carries over its profile; internally it's dubbed the Signature model. 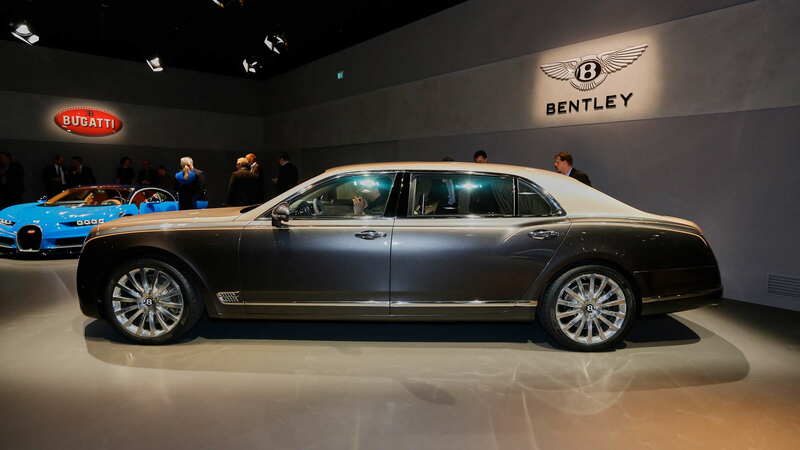 The higher-output Mulsanne Speed shares its body panels. The new Extended Wheelbase model is just that, a Mulsanne sedan with 9.84 inches added at the rear doors to create a sumptuous back seat, one with airline-style seats and its own sunroof. Extended-wheelbase cars are easy to pick out, even without a standard car for comparison. They have a much more pronounced curve stamped ahead of the rear door handle. 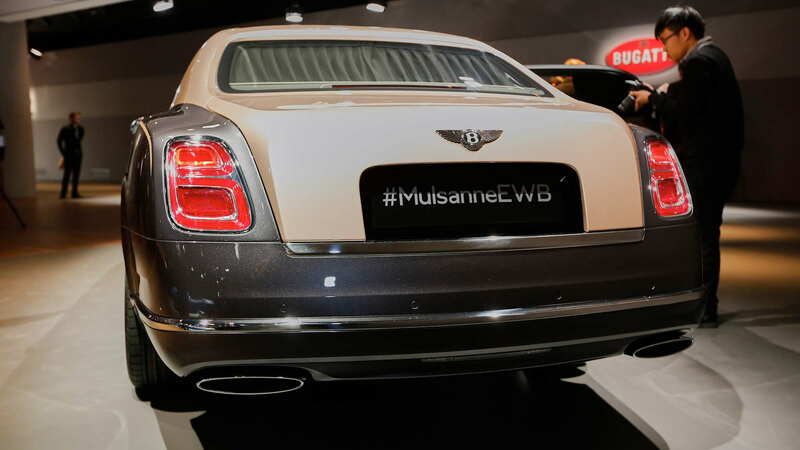 For the crowd that is driven, the Mulsanne goes even further to accommodate. 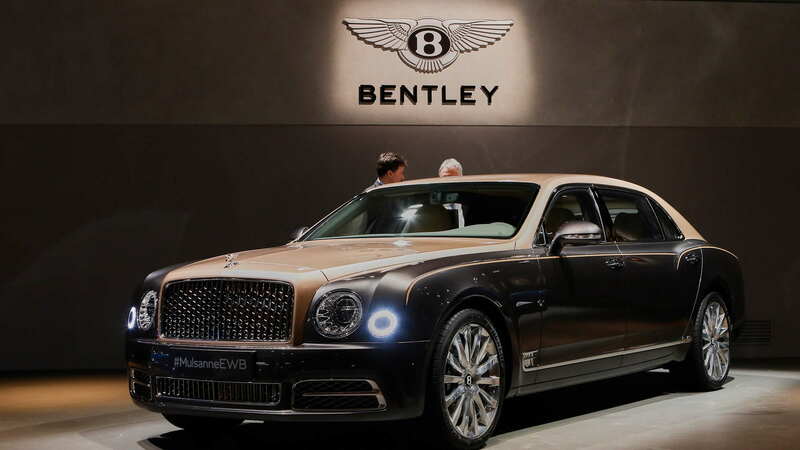 Details like curb weight and price are few--for security reasons?--but Bentley says it will build a longer-wheelbase Mulsanne with an extra 39.4 inches of metal implanted between the wheels. The very large back seat allows four back-seat passengers to face each other. To coincide with the new variants, Bentley has revamped the front end of the Mulsanne, with new fenders, hood, headlamps and grilles, as well as updated fascias front and rear. The grille has prominent vertical ribs, and is 3.2 inches wider than before. On Speed models, the substrate of diamond-hatch grillework is tinted dark, giving it a more menacing effect. On all models, the lower grille is flanked by flying-B air intakes. The massive look is completed by LED headlights with washers embedded in the circular, LED-ringed outboard cut-outs. All four round lighting elements sit on a common level, which lends even more imposing visual mass to the front end. At the rear, the taillights are of the new flying-B variety, introduced on the Bentayga SUV. The rear bumper sits lower, with a stronger horizontal line. With an interior that can take more than six full days to build, the Mulsanne has attention to detail that's usually left to milliners and cabinetmakers. The 2017 Mulsanne has new seats, quilted or fluted, your choice; reshaped armrests and door trim; and switches covered in a thin layer of glass. The extended-wheelbase car throws all the luxury missiles it can at the Maybach and Phantom. It offers a choice of single- or two-tone interiors from a palette of 24 colors, which range from buff tones to tennis-ball-yellow or energy-drink orange (best used as highlights, say, inside the phone drawer on the center stack). Its seats recline and have extendable leg rests. Electric curtains close off the world outside, while a large sunroof for the rear seat opens up the cabin to the sky. There's no shower stall back there. Not yet. The most painstakingly detailed accoutrements live in the center console between the rear seats. They're twin fold-out tray tables, built from almost 600 individual pieces, measuring barely a foot wide and half a foot deep. Heavily chromed and faced in leather, they move with gorgeous mechanical heft, even tilt to hold a tablet computer. 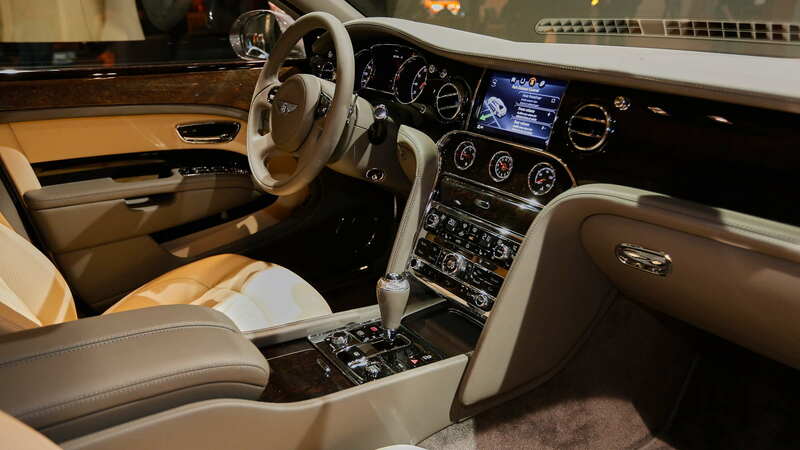 On the technology front, the Mulsanne's touchscreen infotainment system is entirely new. Its 8-inch display screen finally accepts touch and swipe inputs, and is backed up by a solid-state drive with 60GB of media storage. Apple CarPlay and Android Auto are factored into the interface, as is an in-car 4G LTE data connection. Off the options list, the Mulsanne can be fitted with a pair of detachable 10-inch Android tablets mounted to the back of the front-seat headrests. The tablets are enabled with 4G and wireless connections, and come with 32GB of onboard expandable storage. Passengers can use them to streaming audio to the car's speakers; to browse the Web; or to set navigation destinations for the driver via Google maps. The new Naim for Bentley audio system is out to melt faces. It's equipped with 18 speakers, 19 channels of output, and 2,200 watts of power. Bentley says it's one of the most powerful sound systems in production today. Finally, the Mulsanne ups its safety quotient with blind-spot monitors, adaptive cruise control, and automatic high beams. The headlights also offer adaptive shaping of the light pattern for urban, rural, and interstate driving--but that Euro-spec feature likely won't get clearance from the Feds for U.S. sale. On the spec sheet, the Mulsanne's changes are few. The standard car still comes with a 6.8-liter V-8 ("6.75 liters," in Bentley heritage-speak) with 505 horsepower and 752 pound-feet. Coupled to an eight-speed automatic, the engine sends power to the rear wheels, and can push the Mulsanne to 60 mph in 5.1 seconds, to a top speed of 184 mph. Fuel economy hasn't been confirmed by the EPA, but with cylinder deactivation, the Mulsanne can cruise in four-cylinder mode under light engine loads. 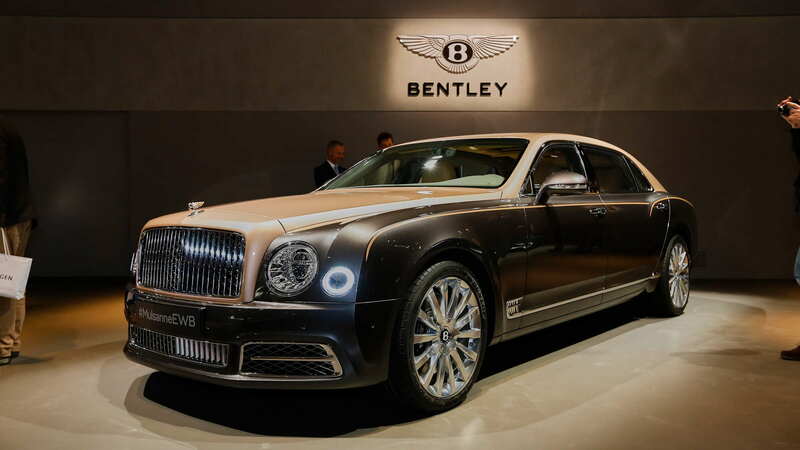 The Mulsanne Speed, introduced last year, tops out the range with 530 horsepower and 811 pound-feet of torque. Its 0-60 mph time is quoted at 4.8 seconds, with a top speed of 190 mph. It wears dark-tinted metal trim and 21-inch wheels, along with Speed badgework. All Mulsannes are said to benefit from revised suspension tuning, active engine mounts, and tires with an internal layer of noise baffling. The Mulsanne's driving-mode selector now toggles from a "Bentley" standard driving mode, through the usual Sport and Comfort modes. A new Custom mode adapts transmission, throttle, and steering to the driver's individual tastes. The Mulsanne's standard air dampers lower the car for better aerodynamics at speed. As before, 20-inch wheels and 265/45 tires are standard, with 265/40-21s optional. With its retuned suspension and long-wheelbase model, it's time to get reacquainted with the Mulsanne. We'll bring you the story on that first drive as soon as we can.